Putin has revealed that he is far more intelligent than the Western media likes to portray him. Putin has pointed out that during the last two World Wars, Russia was one of the allies of the United States. Yes, Russia turned communist and was reluctantly one of the allies during World War II, but that was because Hitler was trying to take Russia as well. What is important to grasp here is that Russia HAS NOT INVADED Europe before. European interests invaded Russia from the Swedish Empire, Napoleon, and then Hitler. Why is the Obama Administration so anti-Russian? That is a curious question for they see Russia as trying to retake the former Soviet Union. Even if they did, where is the real threat to American national security? Is Putin really interested in invading the USA? No way. People in ivory towers like to play chess. 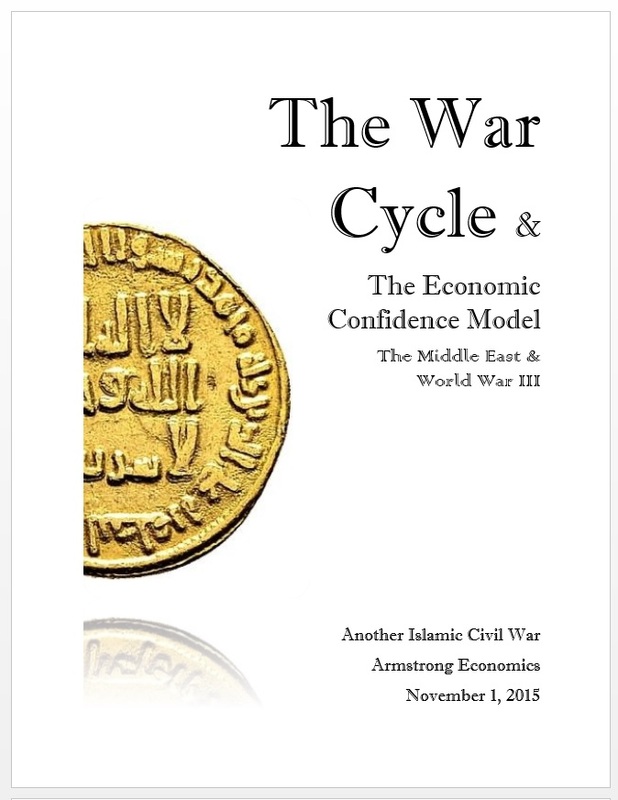 We have prepared “The War Cycle” which is effectively part II of our original publication in 2012. This report will be provided to all World Economic Conference attendees. The fact that Putin began bombing on precisely the target date 9/30/2015 (2015.75) is a serious warning of what is to come. We will accept orders from non-attendees after the conference on Nov. 7-8. The price will be kept reasonable given the demand for the general public access – $75.